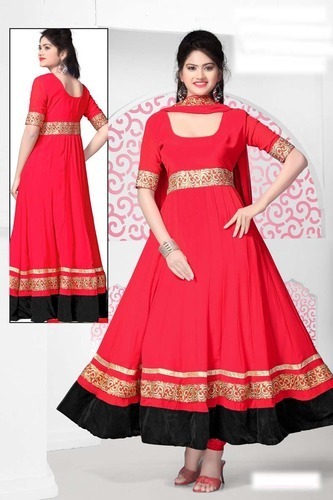 Incorporated in the year of 2011, we "Mukta Mishree Exports", are one of the eminent manufacturer,Suppliers and exporters of the optimum quality collection of Ladies Apparels. Product selection offered by us consists of precisely designed Designer Lehenga, Wedding Lehenga, and Panelled Lehenga. Offered products are highly admired across the market for their perfect fitting, stitching, and attractive pattern. Our professionals consider only high-quality fabric and threads to fabricate the offered products by follow the industry quality standards. We are exporting globally. We have hired a team of highly talented and skilled professionals to designed and fabricate the offered products. We have assorted all the desired weaving machines to prepare the offered product array. We are offering these products in the standard as well as in customized sizes to suit the varied requirements of our patrons. The range of products provide to our customers have catered to the satisfaction level of our patrons. In addition to this, we quickly respond to the requirements of our customers. Customers can avail these products from us at pocket-friendly prices within the committed period of time as per their requirement. For this, we have the long list of customers across the nation.